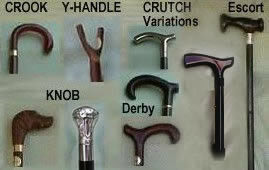 What's the difference between different types of Walking Sticks? If your walking stick falls to the ground will you be able to pick it up easily? The Use - A companion on a stroll, support on a hike, or as a genuine walk aid; collapsible for travelling. The Length - Adjustable length, or the stick may be cut to size. Standard length is 914mm (36 inches). The traditional Crook handle is comfortable to walk with and steady yourself if you stumble, and it is easy to hang up when not in use. It is strongest when the handle is all one piece with the shaft. The Knob handle may be more elegant and decorative. The Y-handle as in the thumbstick is wonderful to lean on and catch your breath. The Crutch handle is more suitable for somebody who really has to lean on the stick, as it helps spread the pressure on the hand, and the modern “Derby” crutch, invented by Lord Derby in England, hangs easily on arm, rail or table. It comes in different styles. Melbourne crutch is very similar. An unusual and eye-catching cane. The black, apple-shaped knob handle features scattered large Swarovski crystals. Mounted on a black hardwood shaft and fitted with a non-slip black rubber ferrule. The overall height is 92cm (36"). A very glamorous, formal walking cane. 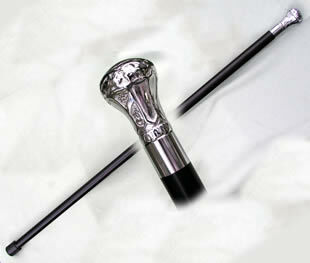 The black, hardwood shaft is fitted with an elegant black derby handle, set with sparkling crystals. The overall height is 90cm (34"). Fitted with an unobtrusive black non-slip rubber ferrule. The black hardwood shaft is fitted with a smart chrome collar and a discreet, non-slip black 19mm rubber ferrule. Overall height 92cm (36"). The milord handle is set with glittering Swarovski Elements and mounted on a black hardwood shaft, fitted with a smart chrome collar. 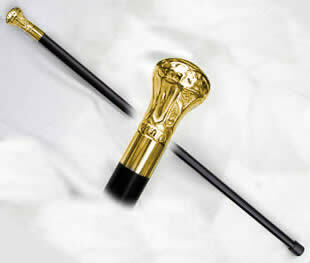 A very eye-catching, elegant, formal cane. This striking walking stick makes an excellent accessory. The overall height of the cane is 92cm (36") and it is fitted with an unobtrusive, non-slip 19mm rubber ferrule. A striking collector's cane, featuring the ever-popular skull head form. Originally, such handles were often carved from ivory). These are made from resin, coloured an imitation ivory colour (left) or gold colour (right) for an eye-catching appearance. Resin allows for a high level of detail, but care should be taken not to drop it on a hard surface as this could damage the handle. The shaft is beech wood, lacquered black. 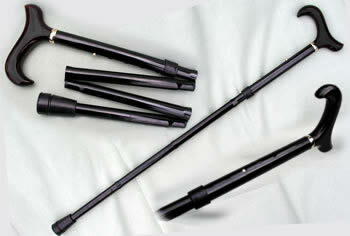 The cane is fitted with a discreet black rubber ferrule and the overall height is 95cm. for sound environmental practices by the Forest Stewardship Council. 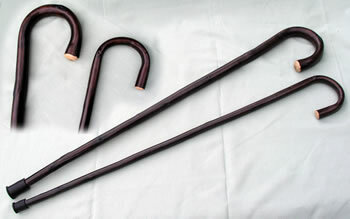 An old-fashioned cane traditionally favoured by farmers and stockmen as an aid for showing and manoeuvring farm animals. Stouter at the ferrule end than at the handle, the shaft is a pale golden colour and is finished with a neat metal ferrule. Overall height 92cm. 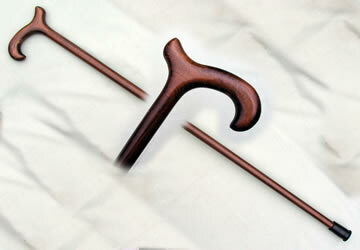 Folding Orthopaedic handle walking stick for left hand or for right hand. An elegant patterned folding cane with a supportive orthopaedic handle, ideal for sufferers of rheumatism, arthritis and other hand complaints. The shaped black plastic handle spreads the user's weight across the palm of the right hand and is easier to grip than a standard walking stick handle. The height can be adjusted between 82-92cm (approximately 32.5"-36") so it can be used by people of a wide range of heights. It is fitted with a non-slip black rubber ferrule and a smart gilt collar. – spike (soft surface) to ferrule (hard surface). Styled after the classic walking sticks, but with less expensive finishes. and if necessary can easily be cut to your preferred length. Saligna wood shaft, longer than usual sticks. The stick is fitted with a moulded crutch handle for comfort and added support. This Comfort grip is ideal for the person who needs to put weight on the stick either through infirmity or inadvertently when out walking. The shape of the grip distributes the pressure over the whole hand (with no pressure points) and the hand cannot slide over the top. The XL stick is too long to post. Courier shipping only. Length - the suggested correct length is just above the top of the thigh bone - which allows the hips and the shoulders to be level when the walking stick is placed fairly close to the body and pressure is exerted. When standing with your arms hanging loosely at your sides, in your usual shoes, measure from the floor to your wrist. on hard surfaces. Reinforced base. this converter for concrete surfaces. With square hole and reinforced base. with the stick on hard ground. that the ferrule won’t last as long. If the walking stick user is not present, for example if they are buying their walking stick by mail order or through the internet, they can determine how long their walking stick should be by asking another person to measure the distance from their wrist bone to the floor. The walking stick user should ensure they are standing correctly i.e. standing upright, in the type of shoes they usually wear, with their arms hanging naturally by their sides.